Here is Trump rolling back progress in keeping our federal lands protected, our air clean, and our heritage intact. And he is proud of it, telling the coal workers behind him that they’re getting their jobs back. This makes no sense to me whatsoever. 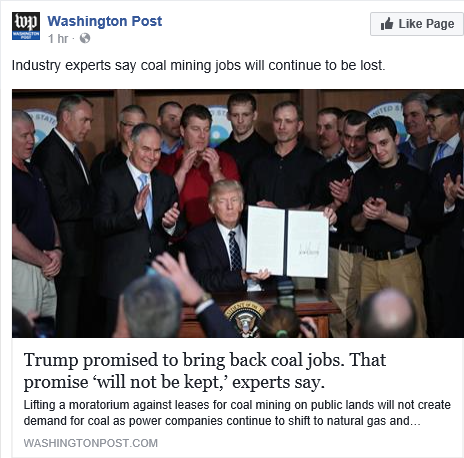 First, as the Washington Post article suggests, the action will not make any difference in the number of coal jobs. Coal production and consumption in the United States has gone from about 820 million tons in 2000 through about 2007, and have steadily declined to below 600 million tons long before Obama’s freeze on federal coal leasing in 2015. Demand has been well below supply for the last 15 years. Trump’s ceremonial undoing of Obama’s regulation will not make any difference in this trend. We’ll burn less coal, and that’s a good thing. Trump and his cronies paid by the coal industry are reveling in the admiration of the coal workers. COAL WORKERS, for heaven’s sake! Coal is one of the dirtiest industries. There is no such thing as clean coal. Not only does it pollute the environment, our water, our forests, coal mines are ugly and leave scars upon the land that will be there for millions of years. Coal workers get sick and die years, sometimes decades earlier than their contemporaries. Read Sons and Lovers by D.H. Lawrence and then tell me you want to work in a coal mine! But Trump and his billionaire cronies think they are doing these coal workers a favor by sending them back into mines. And the coal workers seem to be lapping it up. This is so wrong. The coal workers should be going to school and learn about solar power. That’s where the money is. That’s where the jobs are. This chart shows there are more than four times as many jobs in the solar industry as there are in the coal industry. Even wind energy jobs are more plentiful than coal. When coal demand goes down to 400 million tons in the next ten years, those are the skills they will need. Trump will ride into the sunset of his life then, much richer, living in his golden tower, and the miners will still be unemployed, dreaming about working in coal mines, and admiring their billionaire benefactor. We now have put Scott Pruitt, who has made a career of suing the EPA as Oklahoma’s attorney general, who is a climate change denier – contrary to his own recent statements – in charge of the EPA. We recently saw an executive order to allow dumping of coal mining waste into streams, reversing an Obama order to the contrary. Supporters argue that this is not a new order, but simply a return to standards that were in place since 1983. Ok, so we’re rolling that clock back to 1983, and we’re not so bad, because Reagan allowed it too? This is all done for a few thousand coal mining jobs in the United States. Great. We’re bringing jobs in coal mining and fracking back to the United States. China, Europe and even India are rapidly implementing renewable energy technologies. For instance, in Holland, all trains now run on wind energy. China just canceled 103 coal plants. China leads the world in implementation of solar energy. America puts its people to work in coal mines. China trains its people in renewable energies, software engineering, and manufacturing engineering. That’s how we’re making America great again, folks. In the Vice Presidential debate, Mike Pence mentioned “the war on coal” several times. I had not heard that term before. All I knew was that coal was a major polluting agent and we were doing well by steering our economy away from it. Yes, coal workers would be suffering, just like tobacco workers suffered before them, and blacksmiths when horses were phased out of city traffic. The time of coal is over. Now all we have to do it convince China to do the same. THE FACTS: The coal industry is struggling, but the Indiana governor incorrectly blamed its woes solely on new federal regulations, omitting the effects of steep competition from cheap natural gas. China has succeeded in a major experiment in the process of creating a fusion reactor. This happened on the heels of Germany achieving a similar goal, albeit using a different type of technology. China and Germany are pulling ahead of the United States in research and development of a major game-changing technology. If we don’t watch out, we’ll have to buy required technology from China – at whatever price they set – and we’ll be in the same position we’ve been in for the past 100 years, having to buy oil from the Middle East. All is not lost. Supposedly Lockheed Martin Skunk Works predicts to have a fusion reactor that can fit in a van within 5 years. Hopefully that’s true. Meanwhile, we in the United States spend billions on things that serve no purpose, like defense equipment the pentagon doesn’t want or need, developing the F-35, a fighter plane not up to facing the current Russian generation of fighters, or oil subsidies to the most profitable companies on planet earth. Meanwhile, we’re missing the boat in the areas that really matter: Revitalizing manufacturing in the United States, keeping prices down and productivity and creativity up, educating our children in science and technology, curbing the insane waste of money on military activities, making progress in renewable energies, and upgrading our infrastructure on all levels. Try to buy anything at the mall today that is not made in China. Good luck! In 20 years, we’ll even need to buy our energy in China. After a comment by a reader, challenging my statement about the Middle East, I did a little more searching and found that we import far less petroleum products from the Middle East than we think (and our public perceptions indicates) we do. Here are some interesting graphs to illustrate that. 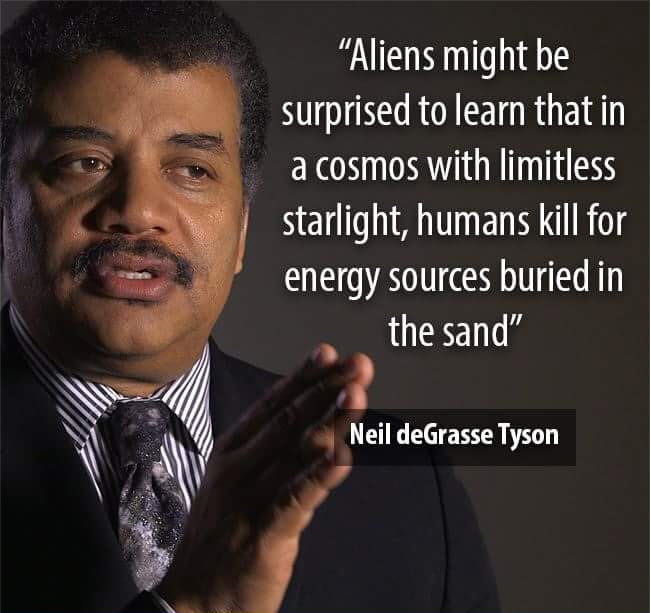 Aliens might be surprised to learn that in a cosmos with limitless starlight, humans kill for energy sources buried in the sand. According to an article in the New York Times two years ago, Bill Koch has been fighting in court for more than a decade to keep a wind farm out of his neighborhood in Nantucket. He believes that the farm’s 130 industrial turbines would not only create what he calls “visual pollution” but also increase the cost of electricity for everyone. We all know the “Koch Brothers” from watching MSNBC. They are the “evil industrialists” that are sponsoring the Republican agenda by pumping hundreds of millions of dollars into the campaign. However, those are Charles and David Koch, the “big” Koch brothers. There are actually two more: William (Bill – featured here) and Frederick. Frederick is actually the oldest brother. He was practically disowned and denied by his father Fred when he was young and openly gay. After their father died, Charles took over the company and the other three brothers were partners in it. Bill and Frederick didn’t really want to continue and wanted to liquidate their portion and cash out. Both got bought out for over $800 million together, more than half of which went to Bill. Charles and David stayed in and continued with Koch Industries. When they went on to thrive, Bill was upset that his $400 million wasn’t enough, and he sued his brothers. That legal battle waged for twenty years and almost tore the family apart. Charles and David prevailed in the end. Incidentally, Bill was also the Koch brother who won the America’s cup in 1992, defeating the Italian team. The 2015 Forbes 400 issue just came out last week. Charles and David Koch are now #5 on the list, with $41 billion net worth each. Bill is #307 with $2.2 billion. Not shabby, but he must be kicking himself for taking the $400 million decades ago so he’d have liquidity. Bill started the Oxbow Group, a company which traded in coal, gas and oil, and he did well for himself. I find it ironic that he does not want a wind farm in his neighborhood, because they look unsightly to those mansions of billionaires nearby. I wonder what he ever did for those thousands of homes of miners, workers and Wal-Mart employees who live downwind from his coal mines, or drink the water downstream from his oil wells? They don’t have unlimited funds to stall him in court for decades, like he did with the wind farm. I actually understand how one can fight for his business. You have to do what it takes to make it live on, survive, and thrive. But I do have a hard time understanding how you can argue against a wind farm, a facility that generates clean, renewable energy as a byproduct of nature. You can sell all the oil in the world. But don’t stop our wind farms as you go about your business. The American Legislative Exchange Council (ALEC) is a Koch-backed conservative group that drafts bills, many of which are designed to repeal and weaken renewable energy laws and standards state-by-state. Republican politicians, who are funded by the Kochs, push these laws in their respective state legislatures. The Koch brothers built the world’s largest fortune based on oil, coal and the distribution, transportation, processing and sale of those commodities. In the last 30 years, Koch Industries expanded into many other areas, buying up hundreds of large and small failing companies and turning them around. One of the largest acquisitions was Georgia Pacific, that makes products like paper towels and such. The Kochs have an uncanny formula for making companies work. Much of their business philosophy is based on libertarian principles, teachings and values. No government. Since the libertarian movement in this country had its peak around 1980 and have never flourished since, the Kochs have backed the Republican Party and its candidates as the closest fit. The less government, the better. No government would be best. Let the free market take care of things. Supply and demand should be the only guiding principles. With renewable energies, versus fossil fuels, the supply and demand principles didn’t work so well over the last 40 years. There were many government subsidies for oil, coal and gas, and Koch Industries has benefited from those. It stands to reason that they will try to squash efforts by the government against support of renewable energies. When you start seeing massive lobbying efforts backed by fossil fuel interests, or conservative think tanks, or the Koch brothers pushing for new laws to roll back renewable energy standards or prevent new clean energy businesses from succeeding – that’s a problem. That’s not the American way. That’s not progress. That’s not innovation. That’s rent-seeking and trying to protect old ways of doing business and standing in the way of the future. No matter what we say about fossil fuels, they are limited. Perhaps we have a few decades’ worth left in the ground, perhaps a few centuries. But they will run out. Not planning for that time would be negligent. Renewable energies do not leave greenhouse gases. Whether greenhouse gases cause global warming or not, it is still better not to pump CO2 into the atmosphere. Renewable energies will return energy independence to countries. There will be less reliance on trade and therefore dependence on other countries. OPEC countries will suffer, but now is the time for them to retool, if they have the wisdom. As renewable energy becomes more used and cheaper, it will drop below the tipping point and it will become a massive local job creator. Preventing or delaying that for today’s profits, as the referenced article suggests, would be obstructionist and unacceptable. Koch Industries knows how to make money and they are not shy about pushing their agenda. We need to take them very seriously. They are one of the most powerful forces in our government today. But I do believe the tide has turned. Now how long will it take China to figure this out? 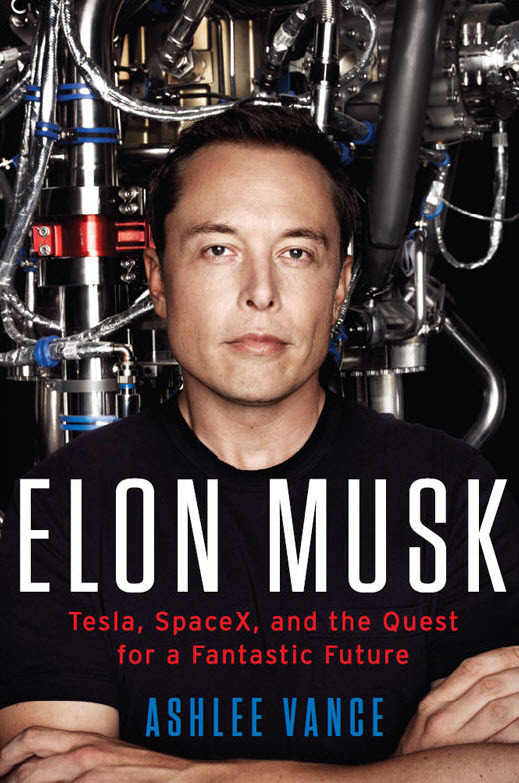 The subtitle for this book is Tesla, SpaceX, and the Quest for a Fantastic Future. There are not many people in history that have created a billion-dollar company. The odds against are astronomical. Elon Musk has created several billion-dollar companies, and right now he is running two of them simultaneously. That is utterly astounding. What does it take to do that? This biography describes who Musk is and how it came about that he was able to accomplish what he did. It starts with his childhood in South Africa, his rocky upbringing and unfortunate family circumstances. He landed in Canada with the proverbial few dollars in his pockets and started working hard, taking menial jobs and trying to be creative. And he made it big. He is now one of the icons of high-tech business in the world. And he has only just started. As I write this, he is only 44. The biography of Elon Musk is required reading for anyone who wants to start a business. I have started a business, and run one, and am still running one. Elon Musk started his first business after mine was already established, and he built Tesla and SpaceX long after I was already rolling along. There is a lot I can learn from him. Reading this excellent biography by Ashlee Vance was a good start. A few years ago I bought this little battery tester at Amazon for about 12 dollars. 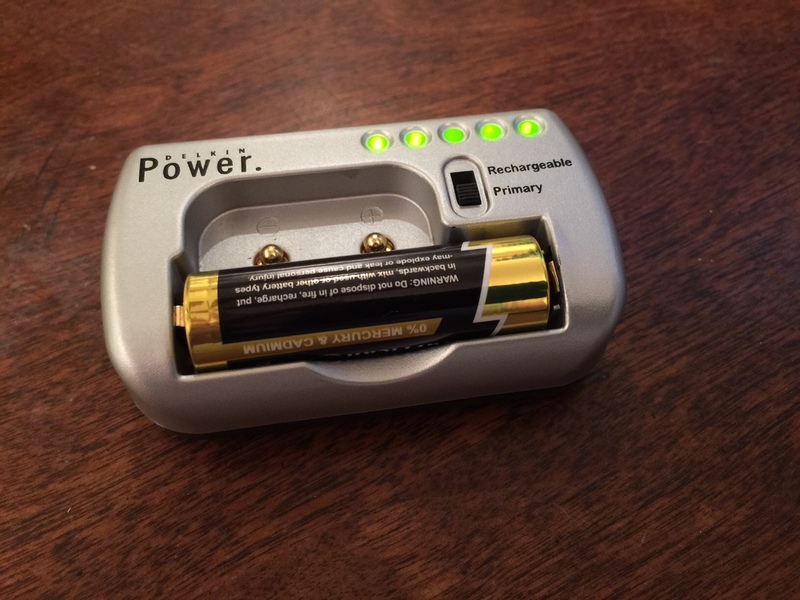 It takes AA batteries, like shown here, AAA, and 6 Volt. It must have saved me hundreds of dollars in battery cost by now. Every time, before I am about to discard a battery, I test it first. When the wall clock falls behind, it must be the battery. Before I go hiking, I replace my AAA batteries in the headlamp so I don’t run out. When my wireless keyboard or mouse act up, the first thing I do is replace the AA battery. I have found that about half of the time, the battery that I was about to put into the recycle container was perfectly good, sometimes at 80% or better. I have started to save batteries at 60% or better in a little box from which I take my “new” batteries when I need them. I believe I buy half the batteries now compared to what I used to before I had this tester. The battery in the tester in this picture shows 100% full, since all 5 LEDs are lit. This is a perfect, fully charged battery, that I was going to throw out. This tester is great value for the money. 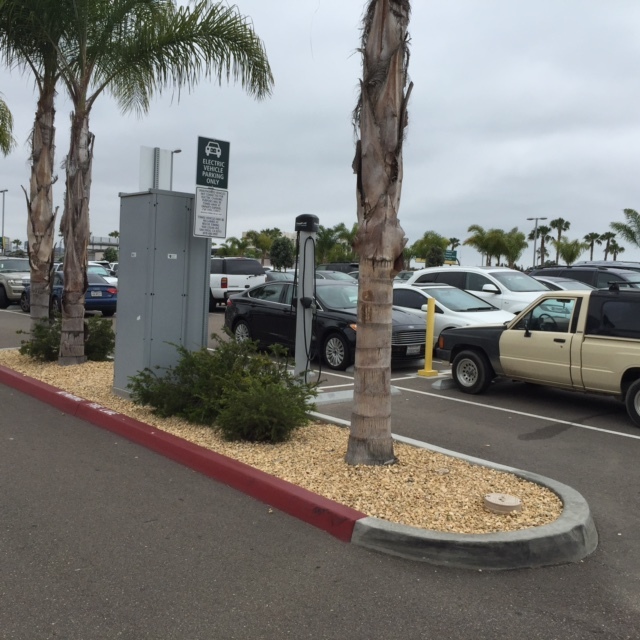 Recently, when picking someone up at the San Diego Airport, I noticed that the entire front row of parking spaces, nearest the terminal, were Electric Vehicle Parking only. You can drive up in your electric car, plug in, and go into the terminal. It made me want to have an electric car. As more homes add solar panels to their roofs and make themselves more and more independent of the power grid, the conventional utility companies don’t like it. 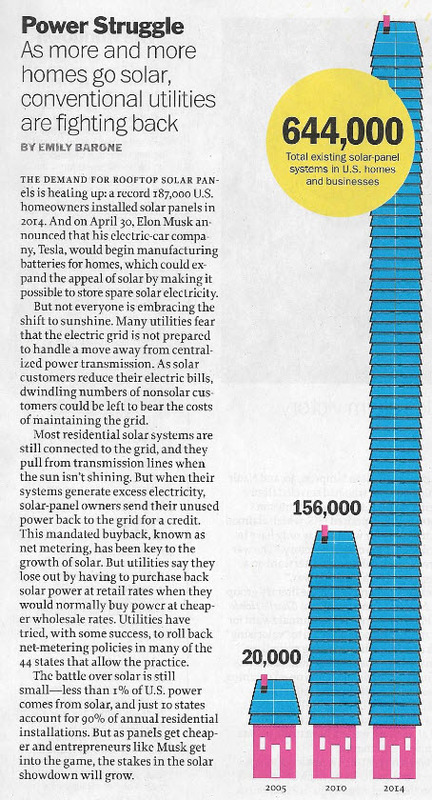 They argue that as less customers are relying on them, it becomes more and more expensive per customer to maintain the infrastructure, the grid, and they must charge their customers more. The utility companies are simply facing the realities of a new world and new industry trends, like so many other companies before them. They will whine for a while, until somebody else comes in and builds a completely new business model and disrupts the entire stodgy utility industry. Welcome to the new reality. Remember when local video stores where you could rent VHS videos for a day were in every strip mall? Then Blockbuster took over. And then Netflix wiped them all out. The taxi industry is suffering from the likes of Uber and Lyft. Remember when you still needed travel agents to book flights? Where have all the travel agents gone? Remember DEC, the second largest computer company in the world in 1980? Bought by Compaq, which was bought by HP. DEC is only a distant memory. Remember when Kodak was a giant? Then Kodak didn’t figure out that digital photography was disrupting their market until it was too late. In the next few years, the power utility industry is going to experience some disruption. There is a fortune to be made for the right player. Let me guess: the right player will not be one of the current utility companies. They are too busy whining and not busy enough thinking.